financial filosophy is a fee only financial planning firm based in New York City, that serves clients nationwide. The architectural structures found on this site represent how the firm's principal lives his life, splitting time between New York, California, and his home state of Texas. financial filosophy is able to provide face-to-face service to clients in these areas, and we are happy to service clients across the nation on a remote basis. Whether through remote or face-to-face contact, financial filosophy is committed to the art and science of our clients' success. 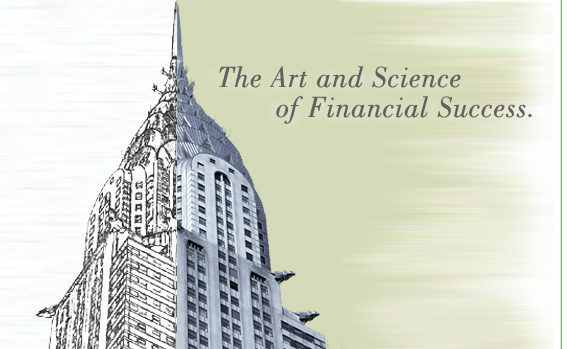 At financial filosophy, there is a clear commitment to both the art and the science of financial planning. The science of financial planning is the most familiar and commonly known aspect. It’s the dollars and cents, the actuarial tables and historical data, the stock quotes and trend lines that, in the mind of an expert, consolidate into the elements of a financial plan. The art of financial planning is a more subtle thing – a way of looking at the data that includes a subjective, creative, value-infused vision of reaching goals. If the science is the brains, then the art is the soul. You are at the center of the process as a clear pathway is seen through the existing environment that leads you to your goal. The very best financial plans – the ones that are not cookie cutter, but are customized for you – come from the analyst’s deep understanding of your life so that he can best advise you of how to take the steps you need to reach your goals. This is the purpose of the initial meeting – for the client to share everything that goes into the creation of the plan. This includes hard data like savings, investments, and debts, as well as the dreams you have for your life. financial filosophy says we offer Customizable Wisdom: advice and guidance on living the life you love by using money in a way that creates the freedom for you to do it. People who have recently become established in professional careers and want to develop a plan now to assure them of achieving their short and long term goals. These clients typically have short terms goals such as paying off student loans and saving for a home, and long-term goals such as providing for their children’s education and their personal retirement. We say our clients are people who are thinking about how to use their money to gain a consistently better quality of life. How you want to live your life is our first concern. Once we have a clear understanding of who you are and what is important to you, we then work with you to create a plan that allows your money to facilitate the life you have expressed. Our focus in on you and your life. We work with you to achieve a course of action that allows you to reach your goals in a manner that is aligned with what is important to you. This allows you to live the life of your dreams without giving up anything you consider vital to who are you. Through the establishment of detailed written guidelines that you can understand, you will see that your goals are being addressed, while offering you peace of mind around your finances and your life as a whole. No longer concerned about your finances, you are free to focus on the areas of life that are important to you. With a plan in hand, you have achieved the beginning steps in your definition of success. You are on your life’s journey with a trusted advisor, always available to you, as your life changes and grows. Together we can create a life you love with the assurance that you have the tools you need to fulfill your dreams.